Another 5.30am start, and another car launch. 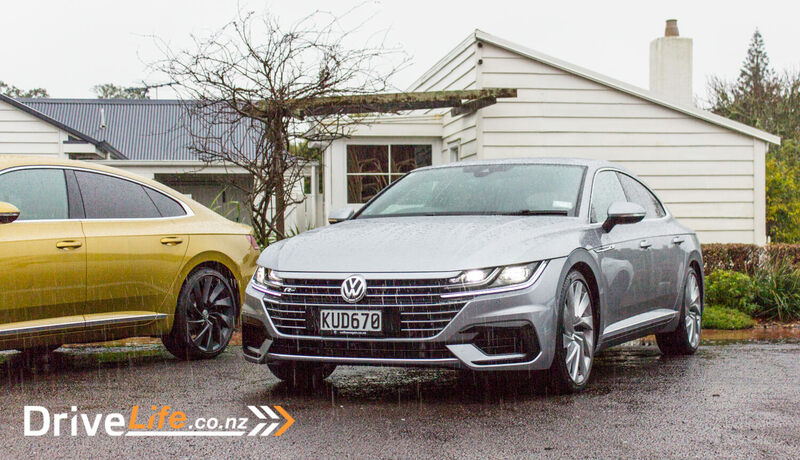 This time it’s a bit more special: VW are launching the all-new Arteon today, this will be the official New Zealand launch of the car. Although I’m looking forward to seeing this car in the flesh, my goal for the day is to be able to spell the name properly, without having to check. 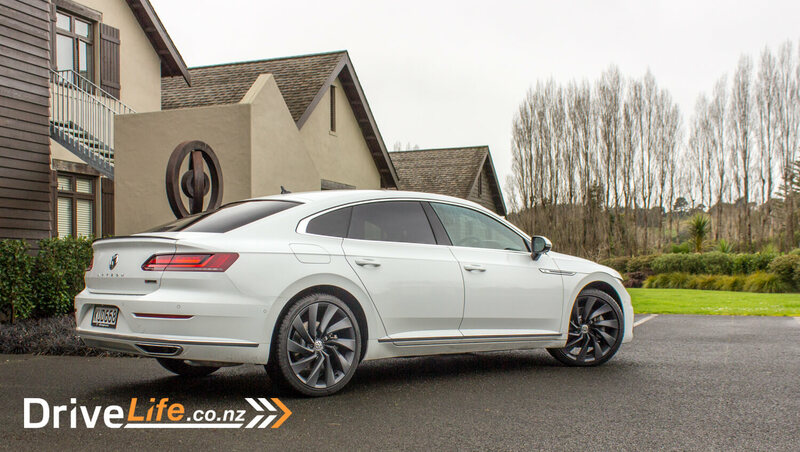 The main reason I put my hand up to travel to this car launch is the look of the Arteon; with a sleek design and pillarless doors, it looks amazing in the supplied photos. But we all know that manufacturer’s photos and in the flesh are two different things. It may look great in photos and only average in person. So with no pressure at all, it was off to Auckland to see if this car measures up to the hype. When I got to Auckland, it was absolutely pouring down with rain – not ideal photo-taking weather. However I knew the Arteon had AWD so all good on that front. A quick run-through with some VW staff had me liking this car already. A healthy 206Kw/350Nm, 4Motion AWD, automatic parking, Traffic Jam Assist, 360 degree camera, 14-way electric driver’s seat with massage function, a 9.2” main display and 12.3” driver’s Active Info Display, and a gorgeous body for under $75K. To me this seemed like quite a bargain. Still, the features are only half the battle – how it drives is what really counts. Since I was late, I had a car all to myself. Nothing wrong with that, but both Turmeric-coloured cars had been nabbed before I got there, and they look amazing in photos. I picked up the last car – a white one – and headed out. VW had suggested going to Piha, but the drive was up to us. I was pretty concerned about the weather, so thought I’d just drive and wait for a break in the weather (if one even came) and grab photos where I could. Finally I got to drive through the new Waterview Tunnel, and headed out to West Auckland. Driving out of the winery where the launch was held were some pretty serious speed bumps, and it tested the car’s suspension out. Let’s say it’s fairly firm, to be generous. Most of the time it was fine, but you can certainly feel the car has some sporty intentions. Performance was the second eye-opener. 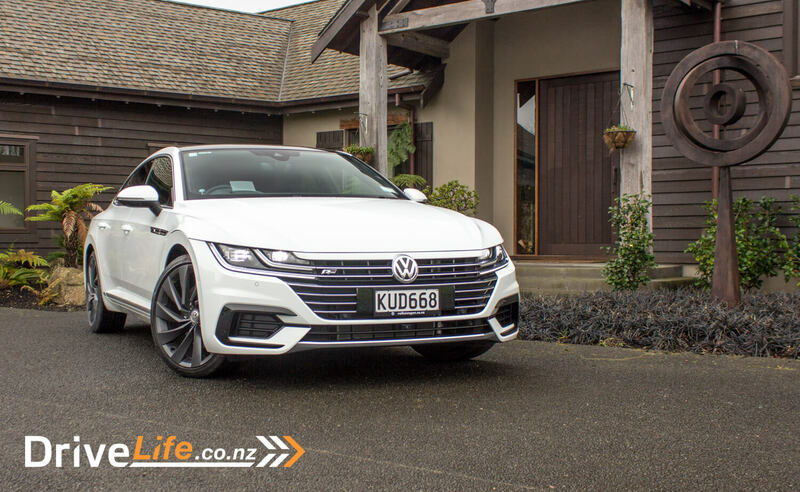 206Kw is nothing to be laughed at, and the Arteon will get to 100km/h in 5.6 seconds. Not too shabby. The noise is makes too is quite nice, when you floor it. I selected Sport Mode a number of times during the day, and the engine made a much nicer noise – I found out later it’s a fake noise, but quite well done. Sport Mode does firm everything up as you would expect, and performance is improved yet again. In any mode on full-throttle acceleration there is some lag off the mark, but once underway this thing can really move. 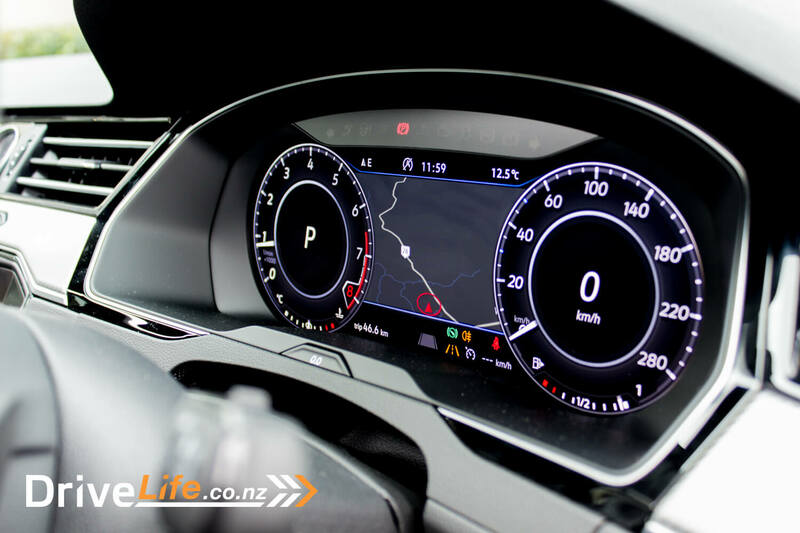 Since my day was driving around Auckland, I appreciated some of the technology in the car – especially the adaptive cruise control and pop-up Heads Up Display. I stopped at the side of the road and checked out the outside. In the early photos, I was blown away by the look of this car. And in the flesh, it looks good too. VW call the Arteon a ‘coupe’ for some reason, and it has a very rakish rear design (VW says they consider it a Fastback design), but not sure I’d call it a coupe. I totally love the rear guards that bulge out from the body, they look masculine and really suit the car. At almost 4.9 metres long, this is a long car – and the wheelbase is long, too. One feature of the car is pillarless doors, and who doesn’t like that look in a 4-door sedan? They look cool and are a real talking point. Rear legroom is extremely generous, your passengers should not be complaining about being cramped up. Popping open the electric boot sees a huge 563 litres of space, and even more incredibly there’s a full-size spare under the cover. My car has the optional 20” alloys, and the spare is a 20” fitted with the car’s same size 245/45/20 tyre. The car comes standard with 19” alloys. I took the car on a few twisty back roads, and the AWD and grippy tyres came to the party. Not only is the grip excellent, it turns-in beautifully. A fun, safe drive in a Euro 4-door express. Time for photos. I was driving past a rather nice-looking house, so pulled up to the gates and hit the intercom button. Would they mind me taking some photos of the VW outside their house? “No problem” was the reply. Thanks Whakata Country Retreat for letting me use your venue. Time for lunch in Riverhead, and more car-talk with other journos and VW staff at Hellertau Brewery. Great food and great company. You really get the feeling that VW staff are passionate about cars too – they aren’t just here to sell cars. After lunch, I headed off for another solo drive, liking this car more and more. I got back to the winery and grabbed a gold Turmeric Yellow Arteon for a few photos. Of course now the rain had stopped and the sun was out. One of the other motoring journalists tells me he doesn’t like the colour, calling it a ‘Marmite’ colour – you either love it, or hate it. I think it’s stunning. The Arteon goes (fast! ), stops and turns. It has gallons of room inside and in the boot, and is loaded with just about everything you could want. There may be some other Euro brands that see this car and its pricing and are worried – with good cause. There’s just one model in the Arteon range – the R-Line – and that’s it. 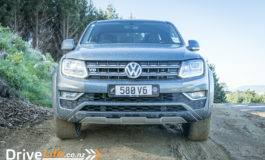 A good move by VW NZ, this is going to be their icon car, so no point watering it down with lesser models. For $75K, this car is great value. Still, as has been seen on other car launches, a day with the car can mask things that annoy you; we’ve locked in a test car for a full review in October – stay tuned. 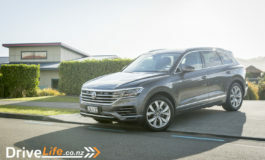 Next article Haval H2 And H6 Launched In New Zealand. Nice review and very helpful. I have been hanging out for a look at this since May and still have to wait until late October for the Australian launch. 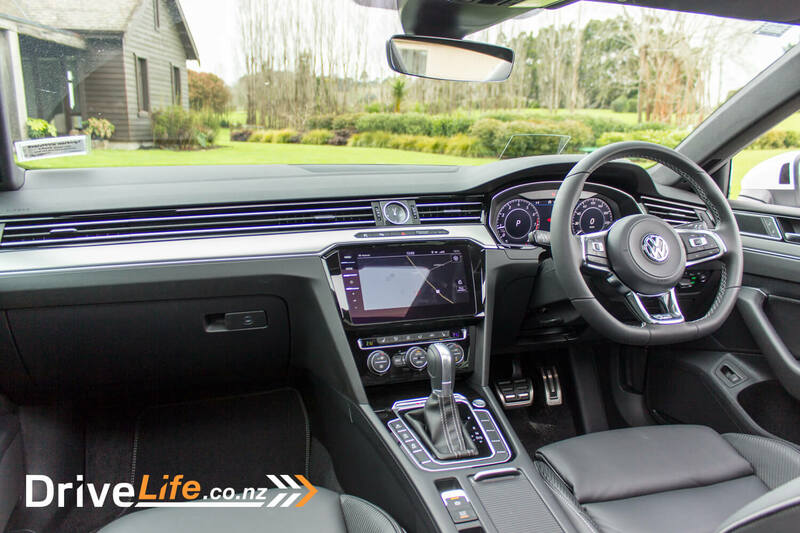 Australian reviews from drives at the factory in Germany have been hung up on the fact that it doesn’t have a “posh” badge and have reviewed it accordingly, without being informative for potential drivers. I have been awaiting a fair review of the R-line under local (albeit NZ) conditions. I am looking for some of the utility of a station wagon but a nice car to tour in and not SUV! I like the AWD and it seems to have much better fuel consumption than the Subaru liberty. Were there any cars with the 19″ standard rims for ride comparison. I am a little hesitant to go the full 20″ and find the equivalent of square wheels on uneven surfaces. While I’ve only spent a day with the car so far, I was impressed. It will be interesting to see what it’s really like after living with it for a week when we test one, but first impressions are very good. There were some press cars at the launch with the standard 19″ rims, but I didn’t manage to drive one to compare. With the 20″ wheels it rode fairly hard over speed bumps, but otherwise was acceptable – especially for the nice handling characteristics. Enjoyed the review. From pictures and videos the Arteon looks fantastic in my opinion. The Turmeric Yellow looks outstanding. What are your thoughts regarding the Pyrit Silver? As per Peter’s comment, I am also keenly interested to know the difference in feel from the 19″ wheels to the 20″ wheels. I prefer the look of the 19-inch ‘Montevideo’ alloy wheels to the 20-inch ‘Rosario’ alloy wheels. 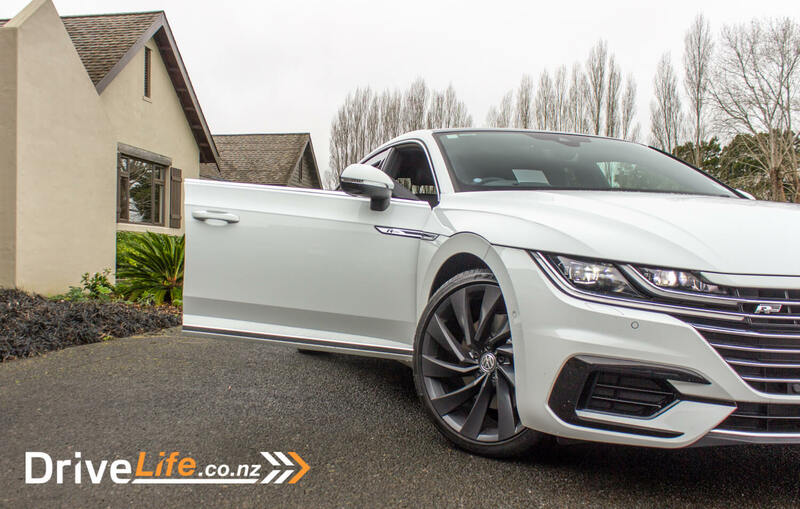 For me the look of the Montevideo suits the character of Arteon more-so, and I wonder whether the 19″ wheels provides a better driving experience. Hopefully in the future you have the opportunity to try out both sizes. It is great that there is a full-size spare, which is becoming a rarity nowadays. 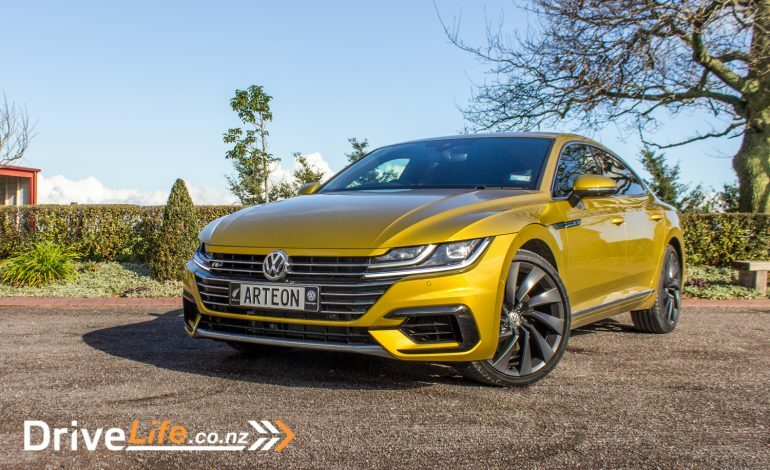 As yet there has not been a cost provided for the Arteon in Australia. We have a review car coming up next month – not sure what wheels it has and I’ll be overseas, so Rob will be reviewing it…so no comparison this time I’m afraid. I think if you like the look of the 19″ rims then go for it – I don’t think there would be a massive difference in the chassis dynamics. Sounds like the AU$ cost would be around $65K? Apologies, you asked about the silver colour. 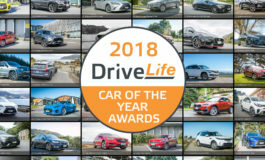 You may be asking the wrong person – I hate grey and silver cars, they are just so common here. In saying that, the one silver car I saw actually looked pretty darn fine. That shape (especially the front) with the silver made it look very sharp. Hello Fred, Thank you for your replies. Looking forward to Rob’s review. Cheers, Nick.